Ground Hog Day--what an American tradition! They wake him from his hibernation to keep up with us all! This one day theme page is filled with preschool activities and ideas for all areas of your classroom. You can either scroll down through this page to see all of the preschool lesson plans and activities for your theme. Show the children pictures of a groundhog. Have them draw a circle on the bottom of the paper bag. Show them how to use the bag as a puppet. They can also draw arms and feet by decorating the rest of the bag. Materials Needed: Brown playdough (store bought or your own home-made batch). Encourage the children to make their own furry little critters! Add flashlights to the block area. See what sized block shadows you can make with one block or a hugh tower of blocks! Circle Time is such a great time for children to learn the social skills of being together as a large group AND to learn more about your Ground Hog Day Theme! 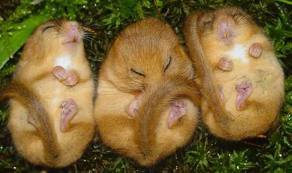 Discuss these furry critters with your children! Provide pictures and books for them to lok at. They are also called woodchucks. They are furry and a bit bigger than a cat. They are vegetarians. 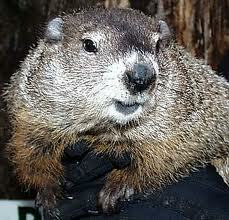 They dig tunnels under ground and hibernate all winter. They are usually brown and sometimes have a gray tone. There is a legend about the groundhog. It states that they come out of their homes on February 2nd to see if winter is over. If they see their shadow, it scares them and they go back to their homes and sleep for another 6 weeks. If they don't see their shadow, they stay above ground and winter is almost over! A song to go with it! what the weather's going to be. Time to stretch. Time to think. Time to eat and time to drink. what the weather's going to be! How much wood would a woodchuck chuck, if a woodchuck could chuck wood? A woodchuck would chuck all the wood he could chuck...IF a woodchuck could chuck wood! Snack Recipe Ideas to Cook Up for Your Ground Hog Day Theme! Provide these greens for the children to help you to wash and cut and put in a large bowl. Enjoy some at snack time with their favorite dressing! Provide snacks that have holes in them to remind the children of the ground hog's burrows! Some examples are: pineapple rings, swiss cheese, bagels, or make toast and have the children cut out holes using a cookie cutter! Ground Hog Day would not be complete without some light and shadow play! Set up a burrow by hanging a dark blanket or sheet in your dramatic play area. Provide flashlights and encourage the children to create shadows. Provide different shapes of paper as well as stuff animals to shine the lights on to see if there is a shadow! Provide green, brown and white paint! 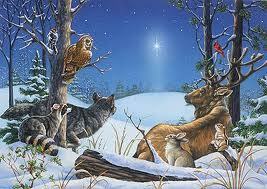 Encourage the children to paint our furry friend coming out of his tunnel...what will he find? Grass? Snow? Of course, it's paint...just let them paint! Ground Hog Day Theme Large Group Games to Help Build Your Preschoolers' Muscles While They Have Fun Together! If possible, go outside on a sunny day! Help the children to find their shadows. When they do, what happens when they back up, or move their arms or move their legs. Take pictures if you are able to show them later! Provide pictures and newspaper articles with pictures in the library area. Save these from year to year! Theme activities to Help Your Preschoolers Develop Their Math Skills and the Small Muscles in Their Hands! In advance, cut out a 10-12 shapes all in the same color. Also cut the same shapes out from black paper. Glue the black "shadow" shapes to the inside of a manilla folder. Provide the colored shapes for the children to match to the shadows. Laminate the shapes for durability. Store the shapes in a ziplock baggie and then store inside the folder for future use. VARIATION: This could be used when working with numbers or letters as well. This is a traditional activity and great for fine motor development and name writing. Make a cut mark in the bottoms of the cups, wide enough for the craft stick to fit through. Have the children print their name on one side of the craft stick. On the other side, have the children use the marker to make a face on the top end of the craft stick. Show the children how to slide the stick up and down through the cup for their Ground Hog to come out and check for its shadow! Ground Hog Day Theme Music and Movement Activities and Ideas to get your Preschoolers Movin' and Groovin'! Choose a child to stand up and "strike a pose". The other children should copy, or "shadow" that move! You could start to show them how. For example, stand up with one leg in the air and one arm up to the sky and invite the children to copy or shadow you! Ground Hog Day Activities for Your Sand and Water Table! Materials Needed: Sand; small, plastic spray bottle with water in it, sand toys. Encourage the children to make tunnels, holes, burrows, etc. in the sand. Of course, sand castles are fun to make ANY time of year! Ground Hog Day Theme Science Activities--for your Preschool Scientists in Training! Materials Needed: Ruler, paper, marker, a sunny day! Take a favorite object outside and place it where the sun creates a shadow. Measure how tall the shadow is with the children and write it down. Come out and check the shadow and re-measure every 1/2 hour to an hour and compare what happens. Each time you go out, discuss shadows and the sun: Where is the sun now? Where is the shadow? VARIATION: If you can, draw the outline of the shadow you are observing with chalk. The children will be amazed that the shadow has moved! 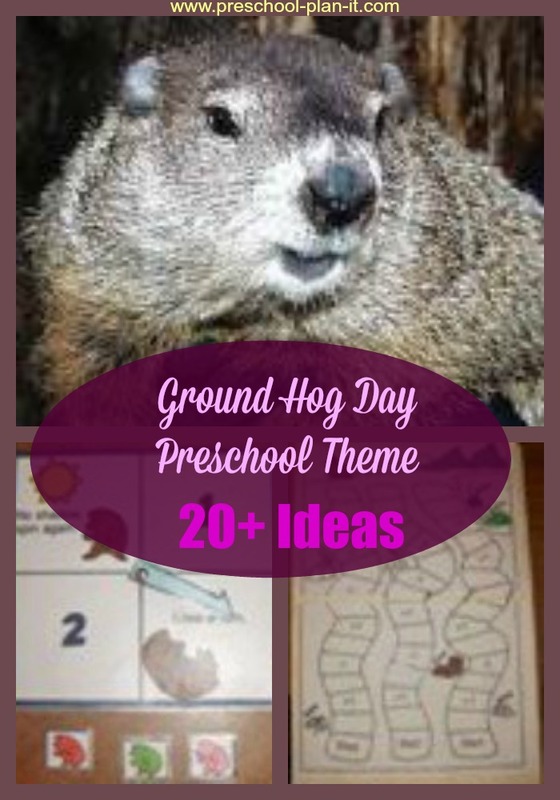 Writing Activity Ideas for Your Preschool Classroom's Ground Hog Day Theme! No Activities Here Yet! Have one? Send it to me by clicking here! Be sure to tell me it is for the Ground Hog Day theme!